This year’s Southwestern Ontario Regional Association of the Canadian Phytopathological Society (SORA-CPS) meeting to be held in Simcoe, ON on Friday, Nov. 2, 2018. Students attend for free. If you have not yet registered and/or you wish to submit an abstract for CJPP, please fill in and submit the registration form by Friday, October 29. Place: Simcoe Resource Centre Auditorium, 1283 Blueline Road, Simcoe ON (just north of the corner of Hwy 3 and Blueline Road), Simcoe, ON N3Y 4K3. The Agenda for the 2018 Annual Meeting is available here. See you at the SORA-CPS meeting in Simcoe ON, on November 2nd, 2018! The Southwestern Ontario Regional Association of the CPS (SORA-CPS) held its annual meeting from 9:30 am to 4:00 pm on November 3, 2017. The meeting was held at Rittenhouse Hall, Vineland Station, in the Niagara region of Ontario. 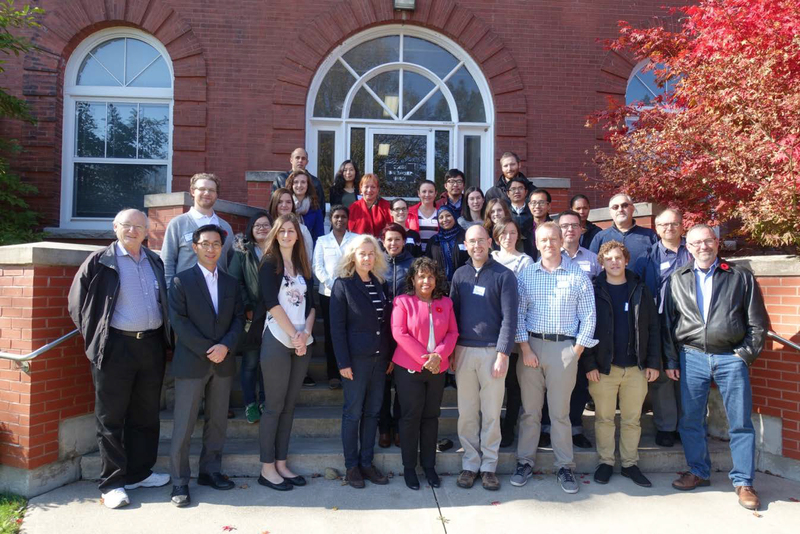 The meeting was attended by over 43 attendees including students,, researchers, technicians, extension specialists and industry representatives. The program for the meeting included five invited talks and 15 poster presentations on a wide range of phytopathological topics. Registration with coffee and cookies started at 9:30 am. Dr. Ken Conn, Regional Representative of SORA-CPS and CPS Treasurer (2012- ) presented opening remarks, welcomed the participants to SORA-CPS annual meeting and acknowledged the generous sponsors of this meeting. Dr. Denis Gaudet (CPS President) could not attend the meeting but sent in greetings from the CPS Board of Directors and CPS membership to CPS-SORA. The letter provided an update on national topics. Student members were encouraged to join CPS and some of the benefits include a free membership in 2018, the student travel awards and video competition, etc. There were five invited talks which provided updates on diseases during the 2016 growing season and possible solutions for control of some of the diseases. There were four invited talks which provided vegetable pathology, protocols for detection of plant pathogenic viruses, updates on diseases in field crops during the 2017 growing season and possible solutions for control of some of the diseases and international plant science initiatives. Genevieve Marchand and Owen Wally participated as judges for the student poster presentation competition. Dr. Ken Conn announced the four cash prizes to Student poster competition winners. The first prize ($100) for the best student poster presentation was awarded to Stephen Reynolds (supervisor: M.R. McDonald), second prize ($75) went to Amy Fang Shi (supervisor: S. Westerveld), third prize ($50) went to Lilieth Ives (supervisor: M.R. McDonald), and fourth prize ($25) went to Katherine Stone (supervisor: T. Hsiang). Drs. 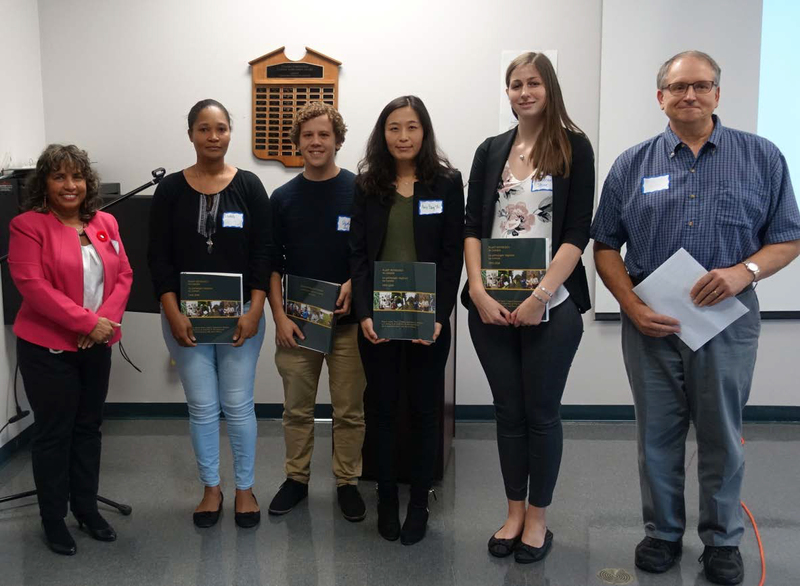 Deena Errampalli (left) and Ken Conn (right) with 2017 SORA CPS student poster presentation award winners; from left: Lilieth Ives, Stephen Reynolds, Amy Fang Shi, Katharine Stone. Dr. Ken Conn conducted the business meeting following the formal talks and poster presentations. Regional funds are in good shape. of the joint Ontario pest management conference announced that the joint meeting was to be held in 2019 instead of 2018. Changing of the year from 2018 to 2019 presents a conflict for SORA-CPS. The Canadian Pathological Society (CPS), the national society of SORA-CPS, will be meeting with Plant Canada from July 7-11, 2019 in Guelph and it is a tradition for the regional societies, in this case the SORA-CPS, to host the national meeting in their region. As a result SORA-CPS will not be able to participate at the joint OPMC, ESC and OWC 2019 meeting. However, SORA-CPS believes in the joint meeting of the Ontario groups and we will be happy to meet jointly with the Ontario groups in 2020. Deena and Ken took this information to the OPMC organizing committee later in November 2017. We are happy to report that the joint meeting of the pest management groups will be held in 2020. Group photo of the attendees at SORA CPS 2017 annual meeting in Vineland, ON. Thanks to the 2017 judges of the student poster competition, and to the local arrangements committee, Deena Errampalli, Karin Schneider, Jody Rae and Jenna Martin, putting together a one day program and the Italian themed menu with meat and vegetarian lasagna, salads, dessert squares, fruit was delicious and memorable. The SORA-CPS regional meeting for 2018 is planned to be held in November 2018 in Simcoe, ON.